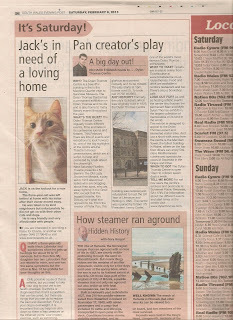 My column for the March 2013 issue of Swansea Life magazine. 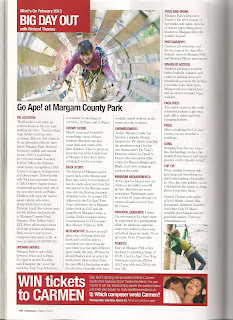 On location: At Go Ape thrill seekers can enjoy up to three hours in the tree tops tackling zip wires, Tarzan swings, rope ladders and hire-wire crossings, but you don't have to be adrenalin addict to have fun in Margam Park. Steeped in history, wildlife and natural beauty, there’s something for everyone inside the park. Located in Port Talbot, along the eastern rim of Swansea Bay, the 850 acre estate boasts a magnificent 18th century orangery, an impressive and picturesque Tudor-Gothic style Victorian mansion house, a 12th century chapter house, ornamental gardens and one of the best deer herds in Wales. Children will enjoy the narrow gauge railway, adventure playground, farm trail and Fairytale Land. For sat-nav users the full address and postcode is: Margam Country Park, Margam, Port Talbot, SA13 2TJ. 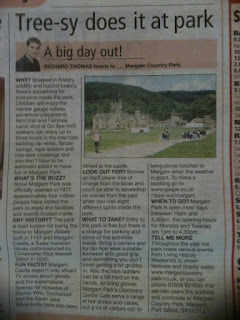 More information about all of the activities at Margam Park can be found at www.margamcountrypark.co.uk, or you can phone 01639 881635. Opening hours: Margam Park is open daily between 10am and 4.30pm. Go Ape! is closed Tuesday and Thursday, the rest of the week the Tree Top Adventure is available for bookings at 10.30am, 12.30pm and 2.30pm. To make a booking go to www.goape.co.uk/days-out/margam. Crowd scene: Mostly teens and 20- and 30-somethings, many of them students. But there are also some dad's and mum's with their children tackleling the the Go Ape course. There's plenty to keep the rest of the family busy at Margam, if they don't want to swing from the tree tops. Back story: The history of Margam can be traced back to the Bronze and Iron Age, and it is even believed that the park’s deer herd was first introduced by the Romans some time after the Roman conquest of Britain in the 1st century CE. Adjacent to the Go Ape Tree Tops Adventure site is Margam Abbey built in 1147 and the magnificent Margam Castle, a Gothic-Tudor mansion house commissioned by Christopher Rice Mansel Talbot in 1830. Noteworthy: Borrow an mp3 player free of charge from the kiosk and you'll be able to eavesdrop on voices from the past when you visit eight different spots inside the park. Written by David Hughes and recorded by local actors, these echoes from the past offer a fascinating insight into the lives of people who have worked, visited or lived on the estate over the centuries. 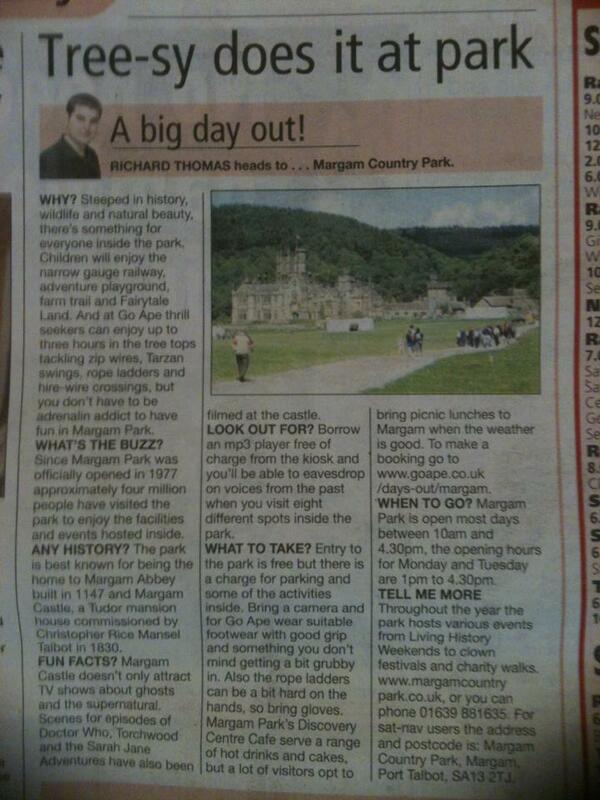 Show business: Today Margam Castle has become a popular filming location for TV shows. Last July the production team for the new drama series the Da Vinci's Demons written by David S. Goyer, who also penned the scripts for Batman Begins and Blade, were busy setting up camp at the castle. Minimum requirements: At Go Ape as long as you can climb a rope ladder you will be fine. But there are some restrictions. Participants must be at least 10 years old and 1.4 metres tall and no more than 20.5 stone. Parental guidance: Under 18s who want to Go Ape must be supervised by a participating adult. An adult can supervise either two children, where one or both of them are under 16, or up to five 16 to 17 year olds. Tickets: Entry to Margam Park is free but there is a parking charge of £3.90. The Go Ape! Tree Top Adventure trail costs £20 for 10-17 year olds and £30 for the over 18s. Food and drink: Margam Park's Discovery Centre Cafe serve a range of hot drinks and cakes, but a lot of visitors opt to bring picnic lunches to Margam when the weather is good. Photography: Cameras are welcome, and the tree tops at Go Ape offer fantastic views of Margam Park and Swansea Bay to photograph. Disabled access: Disabled parking is available within both the Orangery and castle car parking areas and wheelchair access to the facilities is possible from these areas. Margam also have wheelchairs and an electric tramper buggy available for those with disability problems. Events: Throughout the year, Margam Park hosts various events from Living History Weekends to Clown Festivals and Charity Walks. Facilities: In the Visitor Centre in the Castle Courtyard there is a gift shop, park oﬃce, toilets and baby changing facilities. Staff: The staff at Go Ape are friendly and happy to give you all the encouragemnt and help you'll need to stay safe on the course. Pros: After completing the Go Ape course, you are awarded a certificate to show you are now part of the tribe. Cons: Swinging from the tree tops is fun, but landings can be a bit muddy if you haven't had much practice on the zip wire swings. Top tip: Wear suitable footwear with good grip and something you don't mind getting a bit grubby in. Also the rope ladders can be a bit hard on the hands, so bring gloves if you have them. Richard Thomas is the author of Sci-Fi Worlds - Doctor Who, Doomwatch, Battlestar Galactica And Other Cult TV Shows available from Amazon and all good book retailers. Visit www.richardthomas.eu. WHY? Steeped in history, wildlife and natural beauty, there’s something for everyone inside the park. Located in Port Talbot, along the eastern rim of Swansea Bay, the 850 acre estate boasts a magnificent 18th century orangery, an impressive and picturesque Tudor-Gothic style Victorian mansion house, a 12th century chapter house, ornamental gardens and one of the best deer herds in Wales. Children will enjoy the narrow gauge railway, adventure playground, farm trail and Fairytale Land. 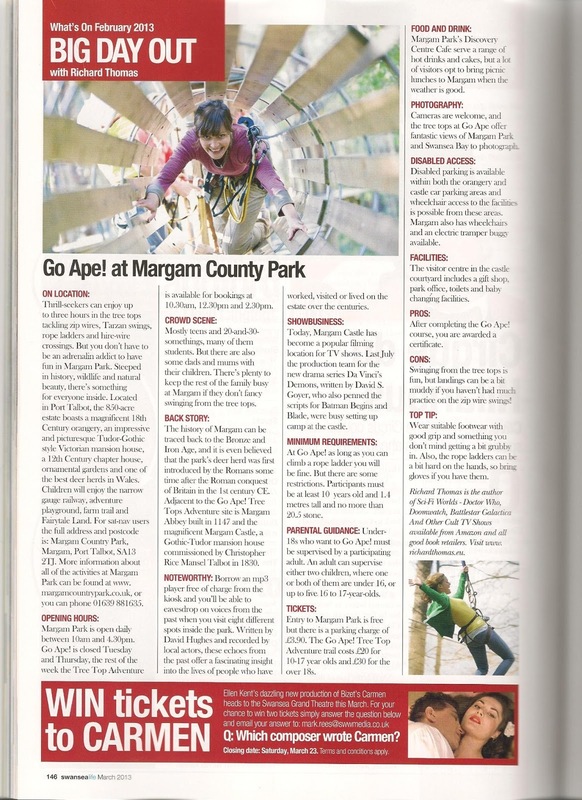 And at Go Ape thrill seekers can enjoy up to three hours in the tree tops tackling zip wires, Tarzan swings, rope ladders and hire-wire crossings, but you don't have to be adrenalin addict to have fun in Margam Park. WHAT’S THE BUZZ? Since Margam Park was officially opened in 1977 approximately four million people have visited the park to enjoy the facilities and events hosted inside. ANY HISTORY? The park is best known for being the home to Margam Abbey built in 1147 and Margam Castle, a Tudor mansion house commissioned by Christopher Rice Mansel Talbot in 1830. Although a relatively modern building, the castle was built on the site of an Iron Age hill fort, and during the ten years it took to complete the castle there were several deaths of masons involved in the contraction work. The Gothic building’s troubled beginning combined with the 4000 year history of the site has attracted many paranormal investigators to the castle. LOOK OUT FOR? Borrow an mp3 player free of charge from the kiosk and you'll be able to eavesdrop on voices from the past when you visit eight different spots inside the park. Written by David Hughes and recorded by local actors, these echoes from the past offer a fascinating insight into the lives of people who have worked, visited or lived on the estate over the centuries. FUN FACTS? Margam Castle doesn’t only attract TV shows about ghosts and the supernatural, scenes for episodes of Doctor Who, Torchwood and the Sarah Jane Adventures have also been filmed at the castle. Last July the production team for the new drama series the Da Vinci's Demons written by David S. Goyer, who also penned the scripts for Batman Begins and Blade, were busy setting up camp at the castle. WHAT TO TAKE? Entry to the park is free but there is a charge for parking and some of the activities inside. Bring a camera and for Go Ape wear suitable footwear with good grip and something you don't mind getting a bit grubby in. Also the rope ladders can be a bit hard on the hands, so bring gloves. Margam Park's Discovery Centre Cafe serve a range of hot drinks and cakes, but a lot of visitors opt to bring picnic lunches to Margam when the weather is good. To make a booking go to www.goape.co.uk/days-out/margam. WHEN TO GO? Margam Park is open most days between 10am and 4.30pm, the opening hours for Monday and Tuesday are 1pm to 4.30pm. TELL ME MORE: Throughout the year the park hosts various events from Living History Weekends to clown festivals and charity walks. Information about these and other events and attractions at Margam Park can be found at www.margamcountrypark.co.uk, or you can phone 01639 881635. For sat-nav users the full address and postcode is: Margam Country Park, Margam, Port Talbot, SA13 2TJ. 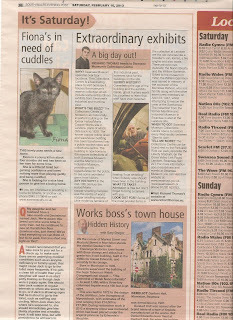 Below is my “Big Day Out” column from the Saturday, February 16, 2013, Swansea edition of the South Wales Evening Post. RICHARD THOMAS heads to Swansea Museum’s Collections Centre at Landore. WHY? Swansea Museum operates over four locations. The Collections Centre is a fascinating place to visit because it houses the museum's reserve collection which include some extraordinary exhibits from Swansea’s industrial and maritime past. WHAT'S THE BUZZ? The Collections Centre is housed in an historically important building on the former Hafod/Morfa Copper Works site in Landore, parts of which date back to 1830. The former copper rolling shed and warehouse building has been transformed into a public-access store and collections centre. The building is now home to the reserve collections of both Swansea Museum and the Maritime and Industrial Museum, providing more opportunities for the public to see some wonderful gems from history. ANY HISTORY? In the mid-19th century the Hafod/Morfa copper-smelting complex was the centre of world copper smelting activity. Little evidence remains of this industrial past, however, save for the buildings on the site. QUIRKY HISTORY? Considering the age of the building and the exhibits inside, ghost hunters won’t be surprised to learn that staff have even reported hearing “loud whistling” when nobody else should have been in the building. WHAT TO TAKE? Admission is free but don’t forget to bring a camera with you. LOOK OUT FOR? Some of the most popular items in the collection at Landore are the old vehicles like a traveller's van, lorries, a fire engine and also boats. There are even two lifeboats; the Naomi Beatty and the William Gammon. Gifted to the museum in 1992, the William Gammon was named in memory of the coxswain of the Mumbles lifeboat, who lost his life along with the other seven crew members on April 23, 1947, whilst attempting to rescue the crew of the Samtampa. The collection from the former Maritime and Industrial Museum in Swansea is also at the Landore site. TELL ME MORE: The Collections Centre can be found next to the Park and Ride car park, opposite the Liberty Stadium, on the Cross Valley Link Road, Landore, Swansea, SA1 2JT. For more information about exhibitions and events at Swansea Museum you can visit their website at www.swansea.gov.uk/swanseamuseum or phone 01792 653763. Visit Richard Thomas's website at www.richardthomas.eu. 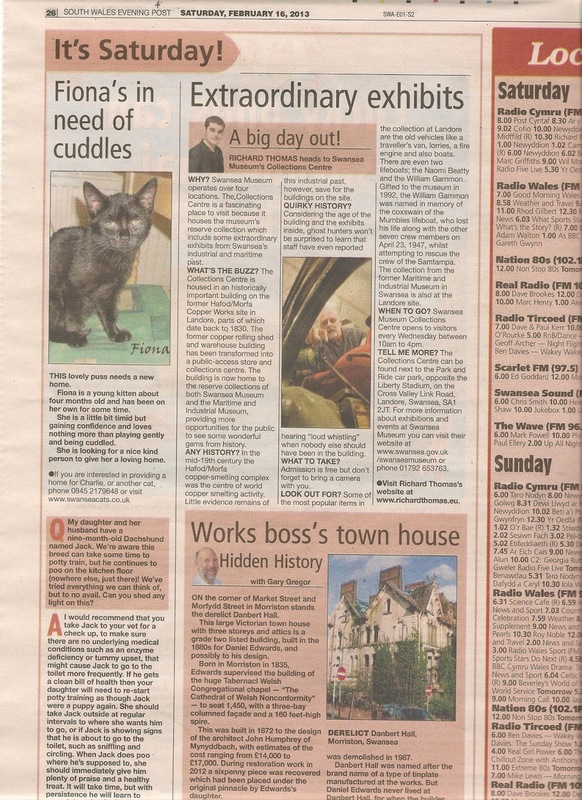 Below is my “Big Day Out” column from the Saturday, February 9, 2013, Swansea edition of the South Wales Evening Post. The Dylan Thomas Centre in Swansea. WHY? The Dylan Thomas Centre is a beautiful building in the in the Maritime Quarter near to Swansea Museum. The Dylan Thomas Centre has a permanent exhibition on Dylan Thomas and his life and is also home to many literary events throughout the year. WHAT’S THE BUZZ? The Dylan Thomas Centre regularly hosts different events, films and talks in its conference rooms and theatre. This February there are lots of events and exhibitions to look forward to, one of the big highlights at the centre are the "Theatre-in-Focus" presentations, which are all script-in-hand and preceded by a talk about the playwright. Next Saturday (February 16 ) Fluellen Theatre present J.M. Barrie's "The Old Lady Shows her Medals", a play set in 1916 about four ladies who are bragging about their sons, who are away fighting in the Great War, except that the biggest boaster, Mrs Dowey, isn't what she appears to be. From the creator of Peter Pan, this glorious and pointed comedy isn't too be missed. The play starts at 1pm, tickets cost £5. To book call 01792 463980. ANY HISTORY? Formerly the city's Guildhall, which was originally built in 1825, the Dylan Thomas Centre building was restored and refurbished to host the UK Year of Literature and Writing in 1995. The centre was opened by former US President Jimmy Carter, one of the world's most famous Dylan Thomas enthusiasts. WHAT TO TAKE? Tickets are available online from Ticketsource at www.ticketsource.co.uk/dylanthomas. Food and drink are available in centre’s restaurant and bar. There’s also a bookshop café. LOOK OUT FOR? As well as hosting artistic events, the centre also houses the permanent "Man and Myth" Dylan Thomas exhibition, the largest collection of memorabilia of its kind in the world. This exhibit is designed to appeal to the Dylan Thomas expert and interested visitor alike. And just a short walk away from the centre is the Meridian Tower, the tallest building in Wales, where on the top floor diners can enjoy first class Mediterranean cuisine and spectacular views of Swansea in the Grape and Olive. WHEN TO GO? The Dylan Thomas Centre is open 10am to 4.30pm seven days a week. TELL ME MORE: For sat nav users the centre's address and postcode is: Somerset Place, Swansea, SA1 1RR. For information about the different events and start times at the centre visit www.dylanthomas.com. 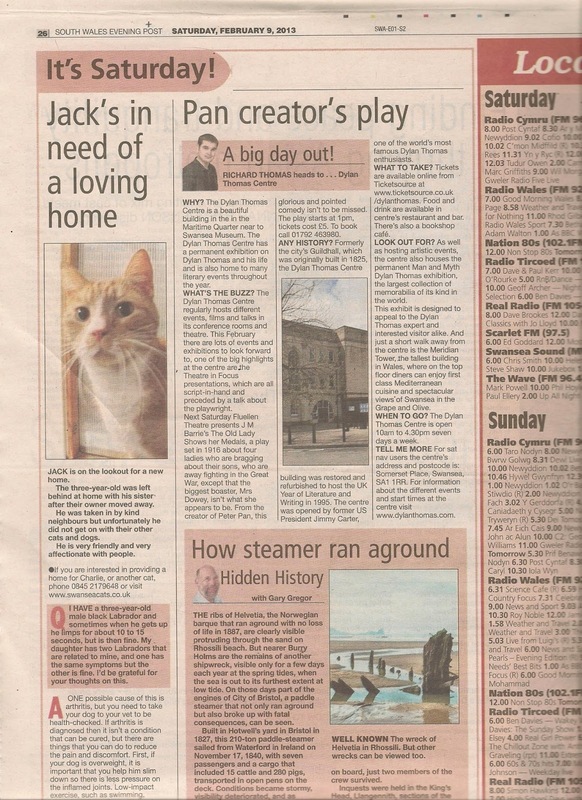 Below is my “Big Day Out” column from the Saturday, February 2, 2013, Swansea edition of the South Wales Evening Post. 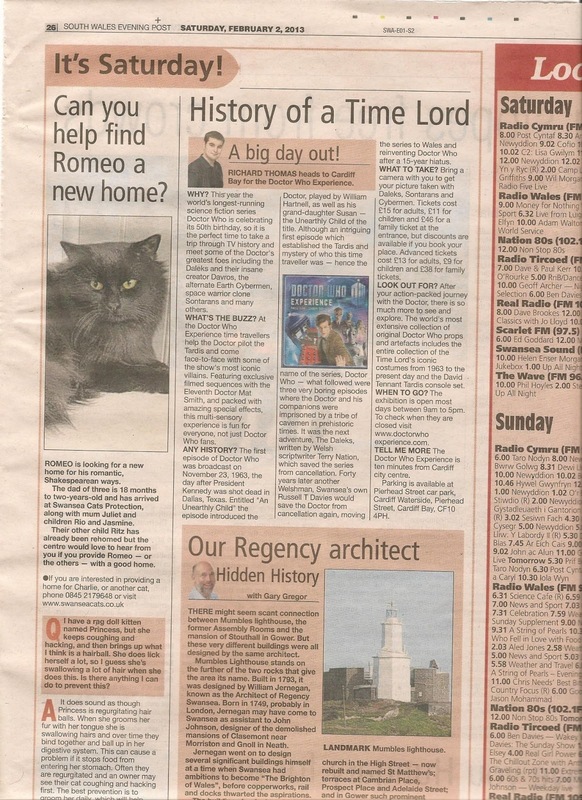 RICHARD THOMAS heads to Cardiff Bay for the Doctor Who Experience. WHY? This year the world's longest running science fiction series Doctor Who is celebrating its 50th birthday, so it is the perfect time to take a trip back through TV history and meet some of the Doctor's greatest foes, including the Daleks and their insane creator Davros, the alternate Earth Cybermen, space warrior clone Sontarans and many others. WHAT’S THE BUZZ? At the Doctor Who Experience time travellers help the Doctor pilot the TARDIS and come face-to-face with some of the show's most iconic villains. Featuring exclusive filmed sequences with the Eleventh Doctor, Mat Smith, and packed with amazing special effects, this multi-sensory experience is fun for everyone and not just Doctor Who fans. ANY HISTORY? The first ever episode of Doctor Who was broadcast on November 23, 1963, the day after President Kennedy was shot dead in Dallas, Texas. Entitled "An Unearthly Child" the episode introduced the Doctor, played by William Hartnell, as well as his grand daughter Susan - the "Unearthly Child" of the title. Although, an intriguing first episode which established the TARDIS and mystery of who this time traveller was - hence the name of the series Doctor Who, what followed were three very boring episodes where the Doctor and his companions were imprisoned by a tribe of cavemen in prehistoric times. It was the next adventure "The Daleks" written by Welsh scriptwriter Terry Naton which saved the series from cancellation. Forty years later another Welshman, Swansea's own Russell T. Davies would save the Doctor from cancellation again, moving the series to Wales and reinventing Doctor Who after being on hiatus for 15 years. LOOK OUT FOR? After your action-packed journey with the Doctor, there is so much more to see and explore. The world's most extensive collection of original Doctor Who props and artefacts includes the entire collection of Time Lord's iconic costumes from 1963 to the present day and the David Tennant TARDIS console set. WHAT TO TAKE? Bring a camera with you to get your picture taken with Daleks, Sontarans and Cybermen. Tickets cost £15 for adults, £11 for children and £46 for a family ticket at the entrance, but discounts are available if you book your place. Advanced tickets cost £13 for adults, £9 for chldren and £38 for family tickets. WHEN TO GO? The exhibition is open most days between 9am to 5pm. To check when they are closed visit www.doctorwhoexperience.com. 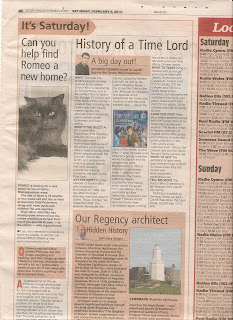 TELL ME MORE: The Doctor Who Experience is located just ten minuets from Cardiff city centre. Parking is available at Pierhead Street Car Park, Cardiff Waterside, Pierhead Street, Cardiff Bay, CF10 4PH. To book tickets phone 08448012279. Richard Thomas is the author of Sci-Fi Worlds - Doctor Who, Doomwatch, Battlestar Galactica And Other Cult TV Shows, available from Amazon.co.uk in paperback and as a Kindle ebook. Visit www.sci-fiworlds.com.